The footnote adds a new dimension to that poem. Another footnote identifies Melvin Deal for whom the poem “In Pliè” is dedicated. This note too adds to the poem’s impact, although the reader doesn’t need the footnotes to get at the essential poetry of either piece. Moreno is an accomplished poet. Her art is not difficult. The poems communicate whatever human scenario is the subject. about to disappear once I round the end of the corridor. Section three, “Night In The Desert”, is a poetical travelogue which gives a picture so much more interesting and human than presented by newspaper writers. Here history and contemporary Egypt merge in all their strange, exotic and everyday wonders. It may be a junk man’s song or a glimpse of the Pyramids or a friendship between speakers of different languages. The poet describes the exterior world, its sunsets, its howling wild dogs, and her interior, her grasping for understanding of such mysteries. Section four, “Uncharted Spaces”, explores the emotional enigmas that live in the familiar scenes in Washington, D.C., Wilmington, North Carolina or in both the music and language in the human heart. The poet doesn’t define these mysteries; she releases them to us in a poetry that makes us pause, listen. Some of the experiences are terrifying as in “Midnight, Waiting for the Last Train”; others are more cognitively lyrical as in “Music—Unlike Poetry—“. In a sense the theme of this section is similar to that of Birds In Flight. Here it is not so much the past that is traveled but the ever present. Section five, the concluding section, “My Father’s Shadow”, is about how the poet coped with her father’s death. This is very personal poetry but it is universally accessible to anyone who loves, respects and was influenced by their father. 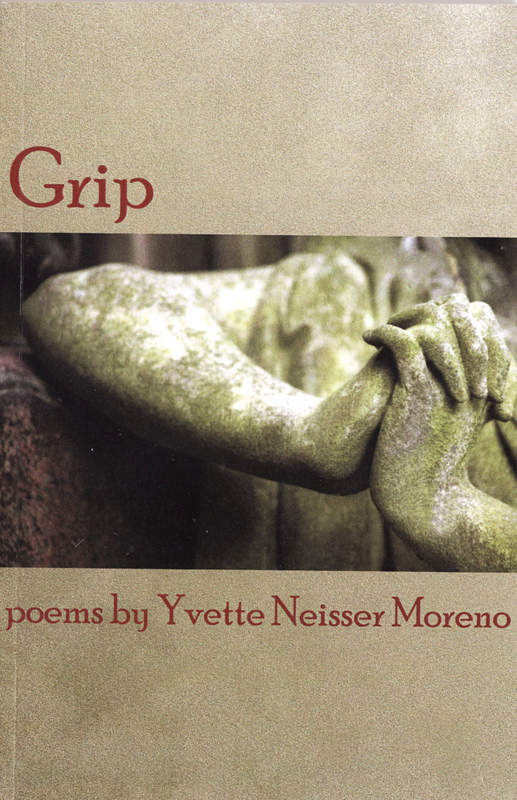 The title of the entire book is Grip; through her poems, Yvette Neisser Moreno holds on to the textures of her varied experiences and in this last section she has a firm grip on the art of poetry. Yvette Neisser Moreno’s poems have appeared in Foreign Policy in Focus, Virginia Quarterly Review, North Carolina Literary Review, Gargoyle, and elsewhere. Her translations from Spanish include South Pole/Polo Sur by Maria Teresa Ogliastri and Difficult Beauty by Luis Alberto Ambroggio. She is the founder of the DC-Area Literary Translators Network, an organizer with Split This Rock Poetry Festival and an instructor at The Writer’s Center in Bethesda, Maryland. Dan Cuddy is one of the editors of Loch Raven Review. In the past, he was a contributing editor with the Maryland Poetry Review, and with Lite: Baltimore’s Literary Newspaper. He has been published in many magazines over the years, e.g., NEBO, Antioch Review, and Connecticut River Review. In 2003, his book of poems Handprint On The Window was published by Three Conditions Press.